Bok Choy is member of the cabbage family. It grows in tall leafy clusters instead of round heads. Mild in flavor and tender (succulent when cooked) in texture, it was originally cultivated in China for its medicinal properties. The name bok choy can be translated to mean “white vegetable” and can refer to the juicy thick white stalks of a main variety that has broad dark green leaves which is how it looks in its most often sold mature form. Lots of varieties of bok choy are being cultivated (in Hong Kong over 20 varieties are commonly available) ranging from baby form (small and light green) to shanghai bok choy (larger with pale green and yellow leaves. Like other members of the cabbage family it’s packed with nutrients and fiber. – Always wash your bok choy well right before using. 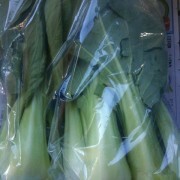 – Choy is most often found sauteed, in stir fries, braises, soups, roasted, grilled and steamed. – Baby bok choy is best cooked. You can steam, boil or sauté whole. – Mature bok choy can be shredded or chopped, then stir fried or added into soups. – Bok choy can also preserved – kim chee or tsukemono style. Look for stalks that are firm and pure white, leaves should be brightly colored and not wilted. Brown spots on its leaves and stalks indicate bruising and not rot, both can be trimmed off before using. Store unwashed bok choy in a plastic bag in veggie bin in the refrigerator for up to four days.